Israel: Replacing What God Has Not written by Mike Oppenheimer is our newest Lighthouse Trails Print Booklet. The booklet is 14 pages long and sells for $1.50 for single copies. Quantity discounts are as much as 50% off retail. Below is the content of the booklet. 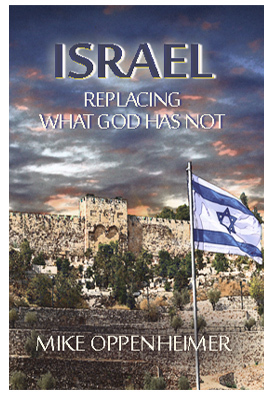 To order copies of Israel: Replacing What God Has Not?, click here. At a time when a clear and biblically sound understanding of Bible prophecy is most important, we find the church, paradoxically, having less knowledge of it, especially as it relates directly to Israel. Most evangelical Christians throughout history have supported the Jews and the modern state of Israel, but things are changing. The church, from its infancy, believed God had a future plan for Israel based on Scripture (Acts 3:19). This plan included the national restoration of Israel to the same land from which they were eventually dispersed. As time went on and the church drifted further and further away from her Jewish beginnings, many began to erroneously believe the church had replaced Israel. But in this day and age when we see biblical prophecy being fulfilled on such an unprecedented and unparalleled scale—with God’s continual protection and restoration of the Jews to their land, there should not be those who walk in disbelief with regard to God’s promises. But there are! A growing number within the church are holding to the position that Israel as a people and a nation has no further place with God and that Israel is eternally cast off for their rejection of the Messiah. They believe national Israel no longer has a future in any part of God’s plan. They also believe all the promises given to Israel have not only been revoked but transferred to the church and that the church is now the “true Israel.” Some even go so far as to make disparaging and untruthful remarks, which suggest the Jewish people are now no longer a “chosen people of God” and are cursed because of their unbelief or that they have inherited all the curses of the law found in Deuteronomy 28–33. They believe all the blessings belonging to Israel have now been transferred to the church, but they neglect to include the curses found in Deuteronomy 28. If one is going to lay claim to the blessings of Deuteronomy 28, then one must lay claim to the curses as well. Nor can we live under the Old Covenant and the New Covenant at the same time. But, these teachers would strip the Jews of the inheritance God pledged to them (and never revoked) and apply all these blessings to themselves. But God sees through the arrogance, and jealousy, that is being rekindled in these last days. Ironically, those who have taken such a stance have proclaimed curses on themselves, for God said He would curse those who curse Israel. Deuteronomy 28 is a conditional covenant of Moses that God extended to the nation of Israel, but we would do well to hold fast to the New Covenant of grace that has now been extended to both Jew and Gentile. Adherents of this Replacement Theology teaching claim the church was already in place in the Old Testament and was an assembly of believers. Therefore, the church, in their mind, becomes the continuation of Israel. Since Pentecost of Acts 2, the term “Israel” now refers to the church, they say. However, if one takes a closer look at how the words in the Book of Acts are used, one will see this is not so. If this is true, then why are there so many distinctions made between Israel and the church throughout the Book of Acts and why are so many distinguishing statements also made throughout Paul’s epistles? Such inconsistency can only originate from a man-made doctrine built on a false presupposition at best. The very first occurrence of the Greek word ekklesia in the New Testament is found in Matthew 16:18. The word “church” (ekklesia, or assembly) is often thought to mean Israel by replacement theologians as a generic meaning for an assembly of worshipers. Thus, they assume the word church is a Greek word for Israel. They believe this is what Jesus the Messiah meant in Matthew 16:18 for the word church (it is only used again in the New Testament Gospels in Matthew 18:17). This would mean there always was the church (i.e., “the church” is Israel continued in the New Testament). However, in Matthew 16:13–20, the word “church” literally means “those called out,” referring to those who confess Jesus is the Son of the Living God—something that was not yet revealed in the Old Testament (this will be further explained as we look at Romans 11). These “called-out ones” are not in reference to the Mosaic Law that was given to the nation Israel but to a whole New Covenant. In the New Testament, the term is used also in the narrower sense of a single church, or a church confined to a particular place. There is the church in the house of Aquila and Priscilla (Romans 16:5), the church at Corinth, the churches in Judea, etc. As I stated earlier, if one were to keep substituting the word Israel for church throughout the New Testament, they would soon begin to see the problems it would create. In Acts 8:3, Saul persecuted the “church” from house to house. He certainly was not persecuting Israel. The fact that Jews were called out of unbelieving Israel to be part of the church does, in every sense, go against the church being Israel. In the same way, if one uses the word “church”or “the church” interchangeably for Israel, even more problems occur. context, and the term “the church” be what God would have it mean in its longstanding, God-given context as well? Was he restoring the church? Of course not. As Israel rejected the chief Cornerstone, Peter remarks that the believers are, “coming, as unto a living stone, disallowed indeed of men, but chosen of God, and precious . . . as lively stones, are built up a spiritual house, an holy priesthood, to offer up spiritual sacrifices, acceptable to God by Jesus Christ” (1 Peter 2:4–5). You “are built up a spiritual house”—oikodomeisthe. These have become a congregation of faith among those who disbelieve. Israel was always referred to as the nation made up of Jews who are physical descendants of not just Abraham (as are the Gentiles) but Abraham, Isaac, and Jacob. Seventy-three times in the New Testament the term “Israel” is used. In the majority of the instances given, Israel is referred to in the national, ethnic sense. There are three main passages used to try to prove the church is Israel. They are as follows: Romans 9:6, 11:26; and Galatians 6:16. I Corinthians 10:18, however, cites “Israel after the flesh” as the true, believing Israel among the unbelieving—just as in Romans 9:6 the Apostle Paul makes a distinction between two Israel’s—one who believes, and the other who doesn’t. And yet, both are ethnic Israelites, but only one has the measure of faith necessary to enable them to faithfully uphold their end of their covenant with God. For without faith, it’s impossible to please God. Galatians 6:16 is often used to prove that the church is Israel. This view maintains that the “Israel of God” is comprised of Gentile believers. The “Israel of God,” however, clearly is comprised of those Jewish believers who, in sharp contrast with the Judaizers, followed the rule of salvation by faith alone. Here Paul is speaking only of a division within ethnic Israel. Some of them are believers and thus truly Israel, whereas others, though ethnically Israelites, are not truly Israel, since they are not believers. No Gentiles, therefore, are found in this statement at all. This Replacement Theology view is often held within groups such as Reconstructionists, Dominionists, and Kingdom Now adherents who hold to a view that we will build God’s kingdom on earth before Christ returns. This non-biblical view presupposes that the Gentile will be able to establish what the Jew could not, but this will never happen. God is so adamant about His covenant with Israel here that He would sooner revoke the existence of the stars and planets that He would withdraw His covenant with Israel. This has not been revoked. To this nation, God will give a land—the land of Canaan (Genesis12:1, 7; 13:14–15, 17; 15:17–21; 17:8). God will bless those who bless this nation and curse those who curse it (12:3). God laid down a divine principle that has been seen and proven time and time again throughout history. When you go against Israel (cursing the people like Balak tried to get Balaam to do), you are going against the Messiah who created Israel to be a blessing to all nations. He promised a land—specifically, the land of Canaan. The emphasis of Genesis 17:9–14 is that circumcision is a token of God’s covenant with Israel—being performed on the eighth day of a boy’s life. Circumcision was to be a sign of one’s Jewishness, or the seal of the covenant. God chose to confirm His covenant with Jacob, as evidenced in Genesis 28:13–15. Then it was confirmed through all of Jacob’s twelve sons, who fathered the twelve tribes that came to comprise the nation of Israel (Genesis 49). Israel was given laws and instructed in all the ways by which to be distinguished, set apart and separate from the Gentiles. Yet, now we have teachers saying the Gentile church is Israel. Such Gentile Christians who claim they are the true Jews and are of the notion they have replaced Israel, should take heed of and fear the words of Jesus when He states that those who “say they are Jews” but are not, are liars and are of “the synagogue of Satan” (Revelation 2:9; 3:9). The promises made to both Abraham and his seed are unsearchably rich in blessings which have not yet come to complete fulfillment but await the Messianic Kingdom. The Abrahamic Covenant contains both physical and spiritual promises. The physical blessings were limited to the Jews (such as the land), whereas the spiritual blessings were to extend to the Gentiles through the Messiah only (upon their being grafted into the Olive Tree). In the Old Covenant, the Gentiles had to convert to the religion of Judaism (but this still did not make them Jewish). God revealed that it was to be through Sarah’s son Isaac that the Abrahamic Covenant would be confirmed (Genesis 26:2–5, and 24). Case in point examples of this include: Exodus 2:23–25; 4:24–26; 6:2–8; 32:11–14; Leviticus 26:46; Deuteronomy 34:4; II Kings 13:22-23; I Chronicles 16:15–19; II Chronicles 20:7–8; Nehemiah 9:7-8; Psalm 105:7–12; Luke 1:54–55, 68–73; and Hebrews 6:13–20. These verses explain how the Abrahamic Covenant is the basis for Israel’s Exodus from Egypt, for giving them the land, for Jewish survival throughout the centuries despite their disobedience, for the coming of the Messiah, the resurrection of the dead, and for Israel’s final redemption and restoration. Israel has become the focus for a watching world, always making front page news, and yet ironically and unfortunately, much of the church, to their own shame, no longer believes in the nation’s relevance today. It is Satan, of course, who has instigated hatred and anti-Semitism towards the Jewish people throughout the centuries. The closer we come to the end of all things and in the final analysis especially, he will be seething, and his rage will be unchecked, for he knows his time is short, and he will do everything in his power to annihilate them in a more horrific manner than even what Hitler was able to inflict upon the Jewish people. In the meantime, we would all do well to remember that any teaching, doctrine, or interpretation must be based upon all of what Scripture has to say on a given subject (both Old and New Testament passages), and not just upon a single verse. We must take the whole counsel of God’s Word. When we study Israel, there is a wealth of information in the Bible awaiting our discovery concerning the people, the nation, and its future. Replacement Theology and its antagonistic view of Israel is perpetuating an anti-Semitic stance within the church. What one believes about Israel is of utmost importance and pivotal to understanding the Bible and the end times. This should be all too apparent, if not self-evident when we study the Word. Old Testament promises made to national Israel will literally be fulfilled in the future just as they were literally fulfilled in the past. The details to support this can be found in abundance in the Old Testament, and we find that both John (in the book of Revelation) and Paul in his epistles often draw on a number of passages to prove their points. As I’ve stated more than once already, but cannot stress enough, if Israel is truly no longer God’s “chosen people,” we find numerous problems inherent with this position that cannot be reconciled with God’s character, His promises, or Scripture. Romans 11 contains scriptural precepts which are critical to understand. To get the complete picture, read chapters 1–10 of Romans through thoroughly. Also, chapters 1–2 of Romans points out how all men are without excuse because of the evidence of the truth of God, which has been with us from the beginning, revealed in creation, and found in nature. Romans 2 discusses the Jew and the law. It points out the futility of trying to obtain salvation through the law—that Jews, God’s chosen ones do not have any advantage over the Gentiles for salvation. For we all have sinned, we all have missed the mark and fallen short of God’s glory. There is none truly righteous—no, not one. The law shows us just how short we fall of God’s holiness. In fact, the Jews who have more knowledge of God, will have even more to answer for. The chapter closes with the statement that it is not enough to be circumcised externally to be a Jew, but rather God’s concern is for the heart to be circumcised or transformed—not an outward change in the flesh but in the inner man. In Romans 3–8, we are told that the Jews had an advantage over the Gentiles in that they were given the truth of God’s Word (the oracles of God) and were entrusted to keep it. However, both the Jew and the Gentile have sinned, and the law did not, does not, and will not justify any of us. None of us are justified apart from a genuine faith in Jesus Christ. If the church was in any kind of position to replace Israel, Paul could not have made such a strong statement. However, we need to pay close attention to how Paul defines Israel throughout the book of Romans and his other epistles. Certainly, these are not Gentiles or “the church” of which he is speaking. For thus saith the Lord of hosts; After the glory hath he sent me unto the nations which spoiled you: for he that toucheth you toucheth the apple of his eye. (Zechariah 2:8).